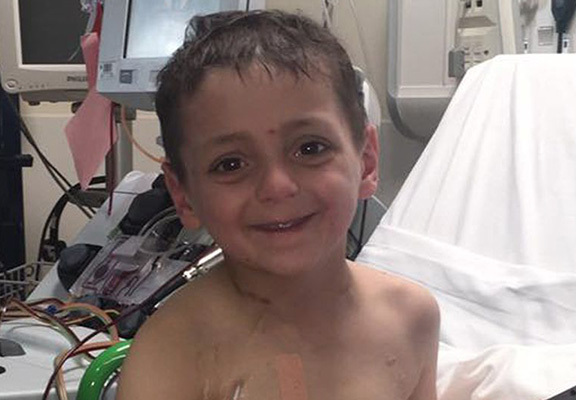 Bradley Lowery invited his girlfriend and his favourite footballer to a party ‘to say goodbye’ as his condition deteriorates. The six-year-old, who has been battling with Neuroblastoma for four and a half years, wanted to hold a get together with close friends and family, before being visited by Jermain Defoe, The Mirror reports. His family posted pictures of Bradley’s ‘bed party’ on Facebook, as he had cuddles with cousins, girlfriend Poppy and Defoe, before falling asleep wrapped in a blanket. Update on brad is….he is very weak and finding breathing difficult but he is fighting it. He insisted on having a party and he invited his cousins and girlfriend poppy yesterday. They all laid on the bed having cuddles I think it was his way of saying his good byes. Late last night his best friend Jermain came to visit him and it was so heart warming seeing how Bradley reacted. He was so happy and laid for ages getting cuddles. Bradley was really relaxed with him. The family also went on to thank well-wishers who have shared messages of support for Bradley after this latest development. Our thoughts are with Bradley and the Lowery family during this difficult time.